Field Day Publications, 2012, x + 133 lgh. Tá an leabhar seo le ceannach go díreach ó na foilsitheoirí nó tríd an suíomh litriocht.com. "Shocraigh Breandán Ó Buachalla ar shraith d'fhilíocht ná raibh teacht uirthi go saoráideach a chur ar fáil i bhfoirm shoiléir sholéite don bpobal. D'éirigh leis agus a chuid eagarthóirí an trá sin a fhreastal go slachtmhar. D'fhéadfá a áiteamh gurb é cnuasach Aodha Bhuí an cnuasach is tábhachtaí sa tsraith seo i dtaobh ná raibh teacht ar cheann go dtí so. Le fiche bliain anuas is mó de thrácht a deineadh ar fhilíocht Aodha Bhuí mar gheall ar a hábhar polaitiúil seachas ar an bhfilíocht féin mar ealaín. Tugann an t-eagrán seo deis don bpobal sásamh a bhaint as a chuid filíochta ealaíonta, ach chomh maith céanna osclaíonn sé doirse nua do staraithe ná raibh teacht saoraideach acu uirthi roimhe seo, agus is ar Vincent Morley atá a bhuíochas so ag dul." Tomás L. Ó Murchú, Comhar, Iúil 2013. "Léiríonn an saothar seo ag Morley an saibhreas léinn a bhain le duine de mhór-fhilí an tseachtú agus an ochtú haois déag in Éirinn. Cruthaíonn an domhantuiscint ag na filí sin ar stair, theanga agus chultúr na hÉireann (dá mba riachtanach a leithéid de chruthú ar chor ar bith) cad chuige a bhfuil staidéar ar shaothar filíochta an dá chéad sin chomh tábhachtach sin ... is é an buntáiste mór a bhaineann le sraith Field Day i gcoitinne agus leis an imleabhar seo go háirithe, go bhfuiltear ag iarraidh an oidhreacht sin a thabhairt chun solais ar bhealach a mheallfaidh daoine chun dul i ngleic go fonnmhar arís le saothar filíochta na tréimhse atá i gceist." Ciarán Mac Murchaidh, Studia Hibernica, 38 (2012). "I ndán 17 a bhreac an Cruitíneach i dtosach an fhoclóra Béarla-Gaeilge, d'áitigh sé go gcaithfí greim a choimeád ar stair na hÉireann trí chúram a dhéanamh de litríocht na Gaeilge. Sin é atá déanta go críochnúil ag an eagarthóir sa leabhar seo, mar creideann sé féin go diongbháilte i dtábhacht na Gaeilge don té ar mian leis stair na hÉireann a scríobh, teoiric a chuir sé ar aghaidh ina leabhar Ó Chéitinn go Raiftearaí: mar a cumadh stair na hÉireann (Coiscéim, 2011). Theastaigh ó Bhreandán Ó Buachalla díriú ar an mac léinn tríú leibhéal, agus ar an léitheoir cothrom sa tsraith 'Filí', trí rogha ionadaíoch de shaothar fhilí Gaeilge ón tréimhse 1700-1900 a chur ar fáil. Aimsítear an sprioc sin go cruinn sa leabhar seo ar Aodh Buí." Úna Nic Éinrí, Eighteenth-Century Ireland; Iris an Dá Chultúr, 28 (2013). 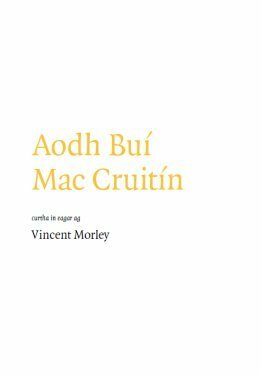 "Deir an t-eagarthóir, Vincent Morley, linn gurb é is príomhaidhm don tsraith seo ná saothair na bhfilí nach raibh teacht air go saoráideach anois a chur ar fáil i bhfoirm shoiléir sholéite. Tá an aidhm sin curtha i gcrích go seoigh aige sa leabhar seo. Is tábhachtaí go mór é nuair a chuimhnímid gurb é seo an chéad chnuasach d'fhilíocht Aodha Bhuí a foilsíodh riamh ... Roghnaíodh dán is fiche don díolaim seo agus ba é sprioc a chuir an t-eagarthóir roimhe ná 'ilghnéitheacht fhilíocht Mhic Cruitín a léiriú'. Is maith an rogha a deineadh."